Portsmouth erected a parish workhouse in 1725 at the north side of the northern end of Warblington Street, the site later forming part of the Colewort Barracks. The building cost about £1,000, with the money being raised by voluntary subscription including £100 each from local MPs Sir Charles Wager and Sir J. Norris, and from Mr. Thomas Ridge, the brewer. Surviving accounts show that between August 23rd 1734 and April 29th 1735, the workhouse consumed 65 quarts of brandy at 1s. 3d. per quart, and 54¼ 1bs. of tobacco at 1s. 1d. per pound, loaf sugar at from 9d. to ls. pound, moist sugar at 4d. per pound, and raisins at 3d. per pound. A parliamentary report of 1777 recorded that the house could accommodate up to 200 inmates. The Poor here are chiefly maintained in a Workhouse, which is said to be neither well contrived nor well managed. There are about 170 inmates and about 40 out pensioners. A standing overseer was appointed in 1794, who has reduced the rates from 4s. 3d. in the pound to 3s. 6d. The parish generally insists on applicants for relief going into the house by which means the expenditure is much reduced, not because the Poor are maintained at a cheaper rate in the house than at their own homes, but because the apprehension of being obliged to mix with various descriptions of indigent people, usually found in a large Poor-house, deters many from making application. This is a great incitement to industry, and prevents many frivolous claims, but it seems to bear hard on the modest Poor, who are the most deserving objects of national charity. Both Portsmouth and Portsea complain of having a great number of casual Poor. Portsea's parish workhouse dates from at least 1764, when the salary of the matron was fixed at £5 a year, and in 1765 Thomas Millaway was appointed Master at £10 a year. The building, at the corner of Elm Lane, Landport (now the site of Gladstone Place) was rebuilt on a larger scale in 1798. It was further enlarged in March 1835 by the addition of accommodation for pauper lunatics. In 1777, the workhouse could accommodate 210. PORTSEA (commonly called Portsmouth Common) contains near 15 square miles, and nearly encircles the small parish of Portsmouth. It has increased lately in wealth and population. Two years ago (1793) there were about 3,050 houses, but 100 or more have been built since then. Farms are from £200 to £300 a year. Rent from £1 to £3 10s. an acre. The Poor are principally maintained in the Workhouse; at present (Oct., 1795) there are 164 inmates, but the usual number in winter is 300, and has been known to exceed 340. Their chief employment is picking oakum. The parish officers are frequently re-chosen, and some for several years, but with no salary from the parish. In general they belong to the dockyards, from whence they receive their wages, and are excused from working, in consideration of their serving a parish office. The Workhouse stands in a good situation, about a mile from the town, and is tolerably well contrived. There are from 2 to 6 feather beds in a room, and iron bed-steads. The house is kept very clean, and the Poor appear to live very comfortably. Those who use tobacco are allowed 2oz. each a week. Either meat broth or a sort of gruel called flour broth, made of flour and water, is their common breakfast. Dinner, 3 days in the week, consists of meat, and on the other 4 days, bread and cheese. Suppers are bread and cheese. Beer is allowed at bread and cheese meals only. Each adult person has 1 lb. of bread a day, and 8oz. of meat on meat days. Portsea Island Poor Law Union was formed on 18th July 1836. Its operation was overseen by an elected Board of Guardians, 21 in number, representing its two constituent parishes of Portsea and Portsmouth. The population falling within the Union at the 1831 census had been 50,389 — (Portsea — 42,306, Portsmouth — 8,083). The average annual poor-rate expenditure for the period 1834-36 had been £15,104 or 6s.0d. per head of the population. 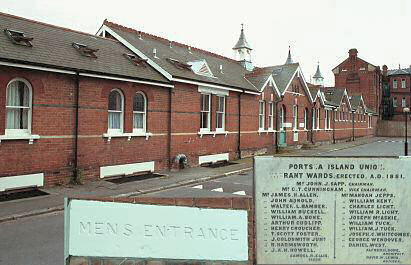 Initially, the existing Portsmouth and Portsea Island workhouses continued in operation. By 1846, Portsea had up to 540 inmates in residence with up to 100 at Portsmouth. The three-storey main building accommodated males at the west and females at the east. A central corridor ran the length of each wing with rooms off to each side. Portsea main block from the north-east, 2001. Portsea main block entrance from the north, 2001. A three-storey infirmary, erected at the same time as the workhouse, stood to the west. The main part accommodated the general sick, with about 100 lunatics in the two end-wings. Casual wards, designed by Alfred H Bone, were added in 1881 at the east of the site. Portsea casual wards from the north, 2001. Separate lunatic wards, costing £19,000, followed in 1883 at the south-east. 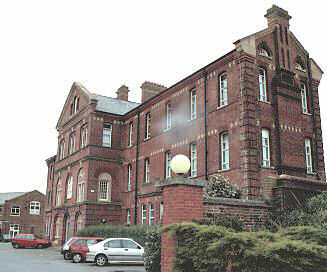 Portsea lunatic ward block from the south, 2001. In 1894, the British Medical Journal set up a "commission" to investigate conditions in provincial workhouses and their infirmaries. Following a visit to Portsea Island, the commission's report noted a number of areas that should be improved. As regards, the sick wards, the report concluded that "though well kept and some of them of good dimensions, [they] are in many respects old fashioned, and far-removed from what would now be considered good sick wards for acute cases." The nursing arrangements at the workhouse were noted as being unusual. The hospital matron and the midwife were trained nurses, and the medical officer selected as their assistants the most capable inmates, one to each ward; these were promoted to be "nurses", given a kind of uniform, and paid a small sum. Further details are available in the full report. The end of the nineteenth century saw the beginning of a major expansion of hospital facilities at the south of the workhouse site. In 1900, the great expansion in Portsmouth's population led to the formation of Portsmouth Parish as the administrative body for poor relief covering both Portsea and Portsmouth. The site later becoming known as St Mary's Hospital. The main workhouse building has now been converted to residential accommodation. By 1865, the Parish had established a children's home at 140 St Mary's Road, at the west of the main workhouse building. It could house up to 400 children. In 1924, the Parish decided to replace the old home with a cottage homes development. For this purpose it acquired an 8½-acre site on Portsdown Hill, Cosham, 120 feet above sea level, and running down to Southwick Hill Road. The first building scheme to be proposed was dropped on account of its expense. In the interval which followed, new legislation and other factors enabled widows to keep their children at home, and consequently the numbers in the existing home fell by about 50 per cent. In around 1929, a modified cottage homes scheme was adopted, and building work commenced, with a foundation stone being laid in March, 1930, by the then Lord Mayor, Councillor J.E. Smith. J.P. The following month, however, in line with national changes, responsibility for poor relief was in the area was taken over by the Portsmouth City Council's Public Assistance Committee and the project was completed under their jurisdiction. For more information on the cottage homes, see the Cosham Cottage Homes page on our companion website www.childrenshomes.org.uk. Portsmouth City Records Office, Portsmouth History Centre, Central Library, Guildhall Square, Portsmouth, Hampshire PO1 2DX. Holdings include: Portsmouth parish workhouse records from 1737; Board of Guardians' Minutes (1838-1930); Lunatic lists (1867-1929); Register of children under control of Guardians (1901-47); Emigration of children (1894-1911); etc. The Portsea Workhouse project by Bob Norman (Department of Archaeology, University of Southampton, 1988). The Hospitals of Portsmouth Past and Present by M Gange (1988).